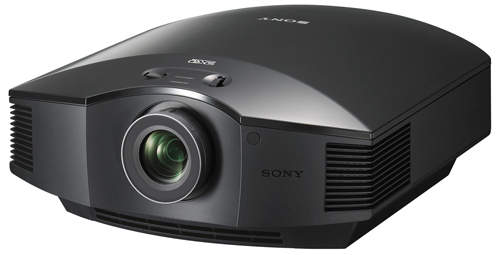 The $1,999 Sony VPL-HW45ES is a full HD 3D, 1920x1080 home theater projector with a 1.6x manual zoom lens, vertical and horizontal lens shift, and a wide selection of enhanced video processing features. It is a solid performer for film/video viewing in a dark or low ambient light setting, and its unusually short 22 ms input lag makes it an outstanding video gaming projector as well. Like most Sony home theater projectors, the HW45ES delivers an impressively high-quality image with rich color, deep blacks, and the full range of subtle gradation that adds three-dimensionality to 2D images. The unit weighs a substantial 20 lbs, and gives the impression right out of the box of a thoroughly professional home theater projector, with an elegant, piano-black design and a center-mounted lens. The HW45ES offers eight color presets and one User mode that are all customizable, with more than enough menu options to let you tweak each mode to taste. All of the preset modes score well on video quality straight out of the box. The three-chip SXRD technology guarantees that there won't be any rainbow artifacts, and it eliminates the possibility of differences between color and white brightness, which can affect both color quality and the brightness of color images. The high contrast ratio yields deep, dark blacks in theater dark lighting and unusually dark blacks even with the lights on. It also gives color that much more pop, adding to a sense of three-dimensionality. Color balance is excellent in all preset modes, with suitably neutral grays at all levels from black to white. There are minor differences in color from one mode to the next, but all the presets offer color that's well within a realistic range, which means you can pick the one that matches the brightness you need without any meaningful loss of color quality. From a subjective viewpoint, though obviously not in terms of precise calibration, colors hit the mark for hue, saturation, and brightness in all modes. You'll likely want to adjust some settings to taste. I saw some noise in clips that tend to cause that problem, for example, but got rid of it without noticeably compromising image sharpness by adjusting noise reduction. The filter works so well that setting it high enough even eliminated noise that was purposely designed into one clip. You may also want to turn off Motionflow (frame interpolation) for filmed material if you don't like the digital video effect that it can produce, or set it to High for live and recorded material, where it can do more to enhance the image rather than distract from it, or experiment with some of the additional settings for viewing 24 frame-per-second content. Similarly, you may or may not like the Super Resolution technology that's part of Sony's Reality Creation video processing. It brings out detail, but can also add artifacts if set too aggressively. Picture controls include the usual basics--like brightness, contrast, hue, gamma, and color temperature--as well as more sophisticated choices like Motionflow, Reality Creation, contrast enhancement options, and a choice of four color spaces, including Rec. 709. You can also calibrate each color space individually and can set lamp brightness to High (bright) or Low (eco) for each mode, so you can automatically change lamp brightness when you change from one preset to another. The nine preset modes (counting User mode) make it easy to find a setting that offers a good balance between the ambient light level and the material being displayed, and the wealth of settings let even those with the most critical eye best match their tastes. 3D Video. The HW45ES supports 3D with Vesa RF glasses, and includes a built-in RF emitter. As with most projectors, for those aspects of image quality that apply to both 2D and 3D, it delivers essentially the same quality for both. It also handles 3D-specific issues well. I didn't see any crosstalk and saw only hints of 3D-related motion artifacts. The loss in brightness with 3D is a tad more than typical, but not enough to be a problem. And unlike most models, the HW45ES lets you choose any of its color presets for 3D. Data Presentations. Although not designed for data and graphic presentations, the HW45ES can do a great job with them. Its 1800-lumen rating is lower than most data projectors offer today, but having the same color brightness as white brightness means full color images can easily be as bright as you'd expect from a 3000-lumen DLP data projector with low color brightness. The match between color and white brightness translates to stunning color quality even in the brightest mode. And, of course, if your presentations include photos or video, the HW45ES is well equipped for them. It also does a great job with detail, which helps even more for data than video. In my tests, both white text on black and black text on white were crisp and readable at sizes as small as 4.5 points. This is going be my projector for my home theater, I am not jumping into 4k just yet. Just got this installed in my new home theater...the picture is absolutely beautiful. At one point I herd my wife next to me actually mutter 'woah'. Just installed this projector, replacing a Sanyo PLV-70. I have a dedicated home theater and ceiling mounted the projector 17' away from a 136" screen. The setup is super easy, the out-of-the-box settings are awesome. The picture initially had a lot of keystone, but ensuring the unit is level and then using the adjust knobs took care of it. The picture guides are very helpful for setup. The picture is bright, even in low-lamp mode. And what a picture! Excellent detail in everything. Scenes that pan are smooth and natural. Colors are excellent, black levels are impressive. We watched something on NetFlix via a Roku and could easily see things moving in the dark shadows that could not be seen by our previous projector. Have not tried 3D, I don't know if it is worth the money to purchase the glasses. Very impressed with this product! A PLV-70 one of the best 720p's back in the day. I wanted one so badly as an upgrade for my VPL-VW10HT many moons ago. Steve, you can use the PS3 3D glasses with this. They are like $10 at Best Buy and work great. Does anyone know where in western Canada to purchase this unit? I added a daylight filter and corrections for even better blacks, worth the $40. I still have mine on low lamp even a year or two later (40es model). Great unit. The best thing I did was add a Monoprice multiformat screen and you will have absolutely no issues with black levels after this. I can't stand seeing the black bars. Yes to everyone wondering, the 3d is indeed worth it. Buy the cheap playstation glasses. buy other active glasses on sale. not uncomfortable, effect is very awesome. I ended up in the maze of a decision for a new projector in the $1,000 to $2,000 price range. This is my third projector and our room is a multiple use room which I would describe as good (the color of the walls and ceiling are not perfect) to very good as it can be fully darkened for movie viewing. The use of the projector in the room is 70% evening/movie viewing with the rest daytime/TV/sports. I was trying to decide between the BENQ HT3050/HT4050, Sony VPL-HW45ES and the Epson HC 4000. I know 4K is hot but then I saw the Sony on sale for $1,500 pre-black Friday and I went for it. Two months later could not be happier. With our primary seating for viewing at 13 feet from a 120” screen, just could not cost justify the minimal sharpness benefit from the Epson HC 4000 4K pixel shifter at that distance. I know the Epson has the enhanced color gamut of HDR and BT2020 but in comparing them, it was minimal benefit for a 25% increase in price. The nature and performance of the Sony LCOS system is awesome, as the picture pops with amazing sharpness for 1080, it has great natural color out of the box and is quite as a mouse. In regards to the BENQ HT3050/HT4050 the Sony also has better blacks, more quality usable lumens, greater placement flexibility and a 3 year warranty versus 1 year for BENQ all for a just a little more than the HT4050. No projector is perfect for everyone, but for my room and use the Sony hit all the marks at a great price. If you really only can use/need 1080 and want the best it can offer, this may well be the projector for you.